An old or outdated kitchen can quickly date and bring down your entire home. A new, complete kitchen remodel may cost as much as $20,000 or more if you let the pros do it, but you can get an updated and more modern kitchen for $1,000 or less by following a few tricks and tackling the work yourself. Utilize paint, tile and a few basic carpentry skills to transform the look of your kitchen on a budget. Some pieces of a kitchen, such as an island, can be added later when the budget allows. Paint the kitchen a new color. A new paint job can transform the look of the kitchen and can be done for as little as $150, including the paint, brushes, rollers and tape. Many of these items, such as brushes and tarps, can be used again in other areas of the kitchen design. Remove, sand and repaint the kitchen cabinet doors. 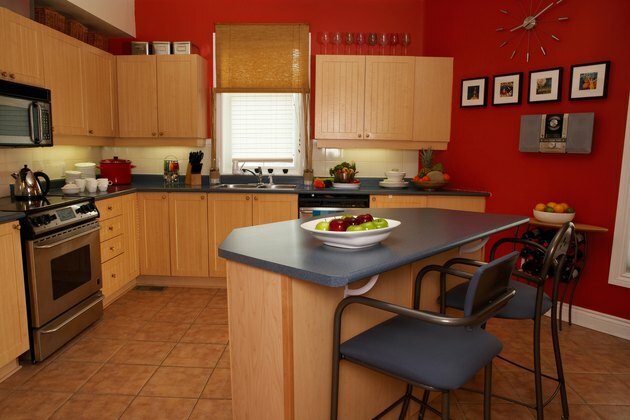 Giving the doors a new coat of paint, along with new hardware, can update the entire kitchen. Rearrange your base cabinets by removing the countertop. Once the counter is off, reposition the cabinets for better flow; for instance, move the sink base cabinet closer to the stove to give you more counter space in that area. Add some shelves to a wall adjoining your cabinets. Use them to store the appliances that normally take up room on the counter. Shelving systems are available at home centers for under $50. Open up the space between the kitchen and dining room by removing the top half of a non-load-bearing wall. Add a new counter to the top of the wall to add a breakfast bar to the kitchen for only a few hundred dollars. Paint the appliances with appliance spray paint. Appliance spray paint costs as little as $30. Use this option if your appliances are in good condition, but have an outdated appearance. Update the counters by unscrewing and removing old laminate countertops and replace them for around $300. Or paint the existing counters using countertop paints that mimic the look of natural stone for around $50. Replace your existing kitchen sink and faucet. New sinks and faucets are available for around $100 apiece. Install a new tile backsplash in the kitchen to add a decorative touch. Tile is available for as little as $1 a square foot for basic subway tile or for $20 for more decorative glass tile. Rent a tile wet saw and install the tile yourself for a cost of from $100 to $400, depending on the tile. Replace your light fixtures with newer models; they're available at home centers for less than $50. Paint your existing tile floor with floor paint and a urethane sealer to update it and bring it into the kitchen's new color scheme.